The Roman remains site is located just past the junction of Bower Avenue and Great Cross Avenue. New signage to mark this area of historic significance was jointly funded by Friends of Greenwich Park and The Royal Parks. On the mound stood a Roman building, thought to have been a Romano-Celtic temple, perhaps in use for much of the time of the Roman period in Britain (AD43 - AD c.410). Temples could be used as centres for healing and pilgrimage, as well as for worship and making offerings to the gods. This site is close to Watling Street, the main road between the Kent ports and London. The temple may have been used by parties of travellers or by a local community. This site was first excavated in 1902 when it was accidentally discovered through routine Park works. Three floor surfaces were revealed. One of these was part of a tessellated pavement (small squares of tile set in mortar). In 1978/79, following the removal of diseased elm trees, another excavation took place. This produced further evidence of a tessellated floor and revealed the south-west corner of a building which could have been a Romano-Celtic temple. In 1999, TV Channel Four's 'Time Team', together with Birkbeck University of London and the Museum of London, undertook a three day dig on the site to produce a programme that was broadcast in 2000. Their discoveries increased the probability that the site was that of a Roman Temple. Finds included a small part of an inscription to Jupiter and the spirits of the Emperors and a stamped tile. Evidence of buildings east of this mound suggested that the temple complex was extensive. It is hoped that further excavations and research into this and the surrounding area will help us to define this building, and understand its place in the lives of people who lived or visited here some 2,000 years ago. 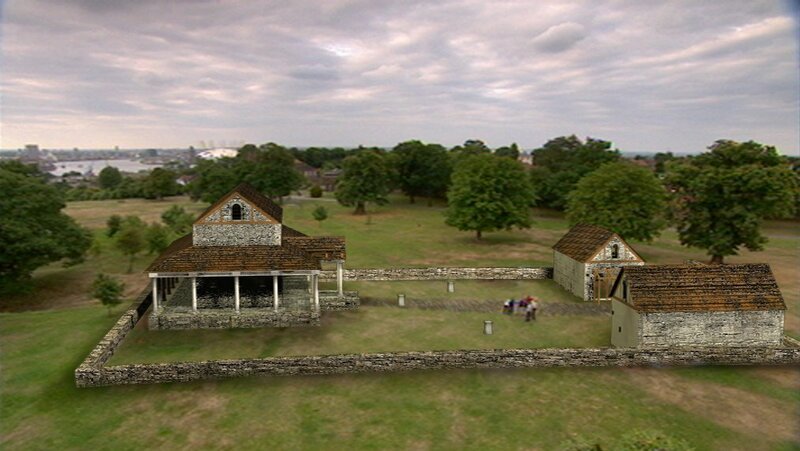 This digital reconstruction of how the Roman temple in Greenwich Park might have looked was created by Channel 4's Time Team. The Friends of Greenwich Park have also funded a booklet covering three self-guided walks that focus on the historic buildings and monuments in Greenwich Park. Well-known local historian Neil Rhind provided the information on which the text is based and topographical artist Peter Kent produced the delightful sketches that guide users on their way. Copies of Walking through History are available to personal callers at the Greenwich Park office at Blackheath Gate and the Greenwich tourist office. They can also be ordered from Friends of Greenwich Park c/o 2 Lock Chase, SE3 9HA (Tel: 020 8852 6158) at £1 a copy post free. Friends of Greenwich Park was set up in 1992 to support Park management, encourage an informed interest in Greenwich Park, the oldest of the Royal Parks, and to raise funds for special projects. It has a membership of over 1700, including 30 corporate Friends.